Daewoo Nexia – a modern car, designed for use in countries with cold climate. Manufactured with sufficient insulation, but in order to reduce the manufacturer puts the insulation of the hood. 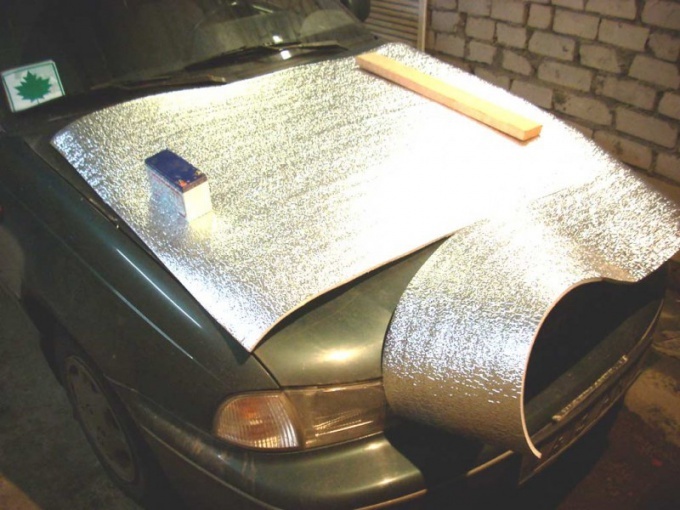 This insulation is made independently using a commercially available foil insulation. Sheet of izolon attach to the inner surface of the hood and mark the workpiece. The contours of the circle with chalk or marker. When you cut provide a small reserve. A blank cut-out fasten with adhesive tape for ease of further work. Then make the required holes for the clips holding the insulation to the metal. Finally, fasten the insulation clips. Put it on a radiator strip of tape gummed up and close the hood. Insulating tape glued to the material and specify the location of the cut. Trim the insulation at the edges, on the edges of the hood, on the inner edge of the engine compartment. At the point of contact with the battery cover with a piece of plastic. Guide the preventive work of the heating system. They are particularly relevant for older machines. Clean and flush the radiator. As a rule, the air flow from the stove after that, it becomes hotter. In winter operation, close the radiator with cardboard or a sheet of izolon (what's better). Insulate the pipework of the heating system. This will reduce heat loss in entering the interior hot air. To do this, cut a piece of insulating material and wrap them with duct. Then secure with cable ties or a good contact adhesive. Also, the old car, replace the door seals. To discover the place of damage to the old seals clean the car at the car wash. The leaked water will indicate seat wear and breakage. New seals are inexpensive, so do not skimp and do not repair them. Purchase and install heated seat covers. The steering wheel also fit Underfloor heating. This will not only keep warm, sitting in the car, but also improve interior comfort and cost when it is sold. For driver heated back will be even and the prevention of degenerative disc disease and sciatica. If the measures prove insufficient and you will want to make the Nexia even warmer, make additional insulation of the cabin. This operation is characterized by high complexity and duration, so to make it better in a professional Studio.